SCARPA is a family-owned company whose Italian heritage and legacy are evident in the quality and design of every SCARPA shoe. Their attention to detail, innovation and time-tested craftsmanship yield incredible value and performance for those who push the limits of their footwear. 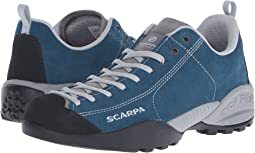 Founded in the Montebelluna region in 1938, SCARPA began their mission of producing the best mountaineering footwear in the world. By the 1960´s, word of SCARPA´s excellent craftsmanship and durability began to spread throughout the northern parts of Italy, and onward to North America. From generation to generation, SCARPA continues their pursuit of innovative mountain footwear.No matter where you go in the mountains, SCARPA is proud to go with you. Wasn't sure they'd break in and they were a tad too narrow. I am a solid Medium, but they were tight across the ball of my foot. These shoes were well made but I found them to be too stiff and heavy for my needs. I returned them. I love this shoe. It's rugged, lasts a long time, and looks great. It's also very comfortable to wear. I bought the Zen hoping to get a shoe similar to the Mojito, but on sale. Not so. The Mojito is popular for a reason. The Zen was on sale for a reason. Stiff, uncomfortable and a bit narrower than expected. Returned the shoe and got the Mojito for $50 more. The first time I put them on they felt a bit tight. After a brief walk, they were very comfortable. I really like the simple but sophisticated style. And...in Italian, Scarpa means shoe. Uncomfortable. Previous model was better. These are great hiking shoes! And they're a lot sleeker looking than a lot of the options. Wish they came in wide, but there's enough room to still be very comfortable. I am sensitive to shoes pressing on my heel (had to return the Salomons) and have had no issue with these! 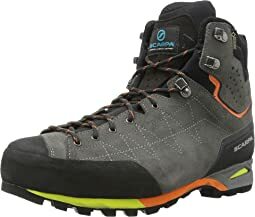 I ordered and tried on a lot of shoes (15+) in the approach and hiking categories. I ended up going with the zen. These are replacing my old 5.10 guide tennies. The target use is multi purpose outings involving carrying moderate loads and scrambling; think climbing the Grand Teton or a week long backpacking trip in the Sierra, not dayhiking nor climbing 5.9 at the crag. My foot is medium width, with a low arch. The shape of my toes requires a wider toe box that doesn't start to taper immediately, otherwise my third and fourth toes (counting from the big toe) will rub. I wear a 12 in dress shoes and a 12.5 in most athletic shoes. The Zen in size 12 was too small with toes touching right off the bat. The size 12.5 (46.5) felt great when I first tried them on, man I was sold. But after walking around and my foot spread out, I found my middle toes just touching the toe cap. I contemplated getting the toe box punched out by a cobbler, but ultimately went with a 13 (47) which fit great. I suggest starting with your athletic shoe size and adjusting from there. You can read lots of reviews out there about the Zen. I'll reiterate that these are kind of an approach / hiking hybrid. They're not light at 21 oz per foot for my size 13s. For reference, my second choice Salewa Wildfires weigh 17 oz, and Salomon X Ultras are 16 oz. Hey, a Mercedes Benz weighs a little more too. They also cost a little more and are made in Europe (Zens are made in Romania). I appreciate the lateral stability these give. The sole has a slightly concave design which should help prevent ankle rolls when going over angled, unstable terrain. I also like the semi-rigid toe cap. We all kick random rocks or roots from time to time. Overall, a big thumbs up for initial impressions. 2 cm piece of vibram sole cracked and chipped away after 10 short (3 mile) hikes rendering boot useless and exposing soft foam underneath. admittedly boot was > 12 months after purchase but was only used about 10x. nonetheless, the sole shouldn't have chipped away. poor quality for $250 boot. zappos would not credit nor facilitate refund. disappointing customer service as I've ordered over 50 items over the years thru zappos. I love these shoes. I just bought my second pair. I love how they are built. I love the style. Last pair I bought was around 6 years ago. I wore them almost daily for 3 years. Then I tried a couple others. This round though, the Zen just wasn't comfortable. If the shoe was available in wide widths, that may have solved my issues. I don't know if they changed the shoe or my foot just grew a bit wider. But I just couldn't keep it. I do recommend you try them. 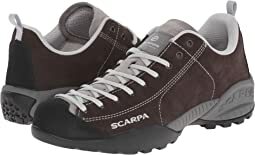 Scarpa makes fantastic shoes and they are worth every penny, if they fit you properly. 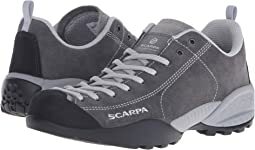 Thank you Scarpa for making a trail hiker with a little more room in the toe box. These shoes are light and cushioned but not so much that you feel like you are clunking around. They felt true to size and feel good on my feet with out any break in period. They are a neutral shoe so if you need a lot of arch support these are not for you. These fit perfectly if I use a regular hiking sock with them. With a thicker heavy duty boot sock they are too tight and so these are my warmer weather boots. For snow I wear a different pair that provides more room for a thicker sock. 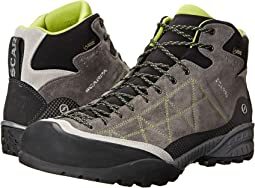 These provide the best support of a "short shank" boot of any I have bought and so they are great for off the trail use or on very rocky trails where ankle support is important. 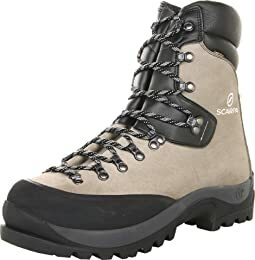 Arch support is good but not as good as the Solomon boots, though my Solomon boots have failed to be waterproof so I now avoid that brand entirely. I added Powerstep inserts which do improve the arch support considerably. After a year of nearly daily use on rough terrain they still are comfortable and fit well and are still completely waterproof. This shoe felt a bit too heavy and clunky, and it's not waterproof. I preferred the lighter weight and wider Scarpa Crux. Also size 7/38 was too tight with a wool sock and orthotic. 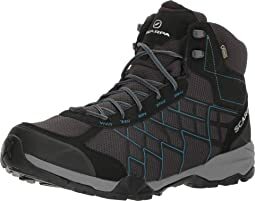 I'd recommend going up a half size to either a 38 1/2 (my size in the Crux but not available in this shoe) or 39 (my size a Scarpa hiking boot). I have a narrow heel, high instep and wide toes. 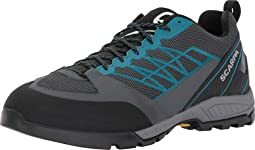 A near perfect lightweight but sturdy walking/hiking shoe for NARROW HEELS and WIDE TOES/HIGH INSTEP (laces go far down and would adjust for a more narrow foot too). It's stylish enough to wear with leggings and a skirt on a hiking plus city vacation. I usually wear size 38 (7) in a regular shoe, but I size up to accommodate a wool sock and orthotics when hiking. 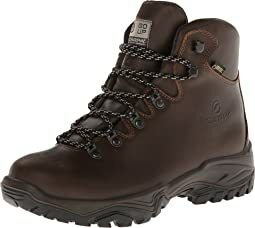 I'm 38.5 in this shoe, but a 39 (7 1/2) in the Scarpa hiking boot. I love that Scarpa comes in European half sizes. My only complaint is it's not waterproof (no Gortex) but it's a keeper. These are the 4 pair I have owned....Never disappointed. These go in the closet until my current ones wear out...But still ticking...but soles are starting to wear after two years. Size and fit of this shoe is accurate. I have become a Scarpa fan (although pricing seems to be getting a little out of hand). When I adjusted the laces to fit my wide toes but narrow heel and orthotics, the tongue cut into my foot lengthwise. 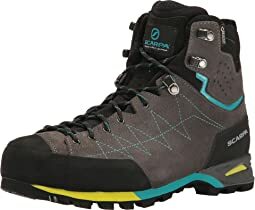 I love the fit of Scarpa hiking boots, which have a sock-like tongue, but this is the second style of approach shoe I've tried with an uncomfortable tongue. It might fit better on a narrow foot. Too bad. Nice light but sturdy style for narrow heels which can be adjusted in front to fit my wide toes with orthotics, but the high and stiff leather tongue cut into my ankle. 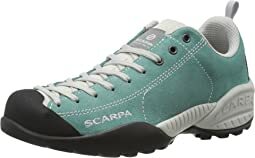 I'm exchanging for another Scarpa approach shoe that appears to have a more padded tongue. Fits true to size 38=7. 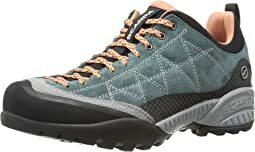 This is the perfect lightweight hiking boot for WIDE TOES with a thick instep but NARROW HEELS. The low lacing system is very adjustable so should work on more narrow feet too (only comes in one width). 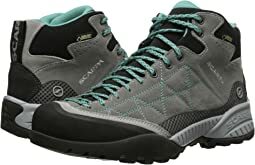 Since Salomon and Asolo have narrowed their regular women's cut in light weight boots, I've been stuck for years in heavy weight backpacking boots to accommodate my wide toes. Regular women's cut is usually too narrow but wide or unisex cuts are often not snug enough in the ankle, leading to heel lift and a sore ankle. The Scarpa's gel padding at the heel is soft on my sensitive ankles but still more supportive than most boots this light. The boot is very breathable, which will be great for summer and in winter there is room for a thick sock. The traction is excellent even on ice. As usual, I sized up from my shoe size 7 (38) to 7.5 (39) to accomodate my orthotics and thick socks in boots. If you're looking for something more affordable, the next best fit was the Vasque Breeze III GTX in 7.5 Wide. However, that boot was wider all around and felt clunky/bouncy. Scarpa definitely nailed it with this one. 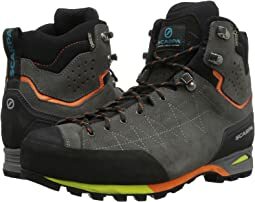 It is with out a doubt the best fitting and most comfortable mountaineering slash backpacking boot I've come across by far. I would say it sits right in the perfect spot for an all around boot right between the Scarpa Zen PRO GTX and Lowa Cevedale PRO GTX. It makes up what they lack in versatility and fit. Has great traction and looks awesome. Which it is! And has a great foot bed. A boot that you will relish putting miles on in the backcountry. I have very wide and flat feet and I have a hard time finding shoes that are comfortable stylish and practical. these shoes do all of that and are great for work, daily hiking, dog walking... et. Unique look. Comfortable right out of box. I have a slender foot and these fit well. No trouble with tongue slippage with lace threaded under tongue flap. As far as Scarpa shoes go this is probably the worst product they’ve ever produced. Very poor ankle support. Basically the shoe is designed on a running shoe platform.